He grew up in a tiny mountain town where fitness is barely on the radar. 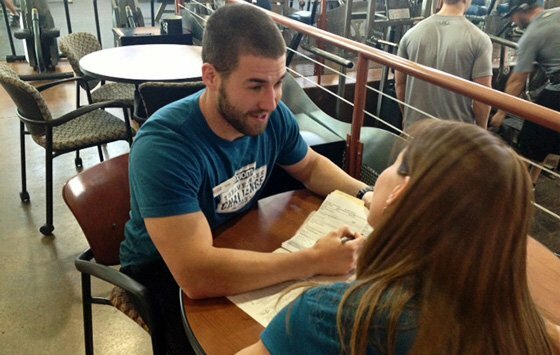 But this didn’t stop Dylan from pursuing a career helping athletes achieve their best! Education/Certification: Associates Degree, Smart Fitness CPT, USAW CPT, NCSF CPT, Dotfit Nutrition CPT, Gold's Gym In-house CPT. Rates: Vary based on duration and number of sessions purchased. At points in everyone's training career, they stumble. They will try a new exercise with a twist and will injure a shoulder. They'll try a marathon, even though their respiratory endurance couldn't pull them through a game of red rover. When we can't wrap our minds (or schedules) around the monumental task of getting fit, we hire trainers to inform, motivate and listen to us. They show proper form, wake us up about our deficiencies, and prepare us to bust through the walls we build around our goals. We found a great young trainer right here in Boise, Idaho, Bodybuilding.com's backyard. Join us in congratulating Dylan Clagg as this month's Personal Trainer of the Month! Tell us a little about your personal and professional background. I grew up in the small town of Council, Idaho. There were few things to do in a town consisting of 800 people. There were two social categories one would fall into: sports and hunting, or drugs and alcohol. I always thought I would grow up to be some great sports star—that didn't happen! So what was the next best thing? Living and promoting a life of health and fitness! I started as a fitness professional at Parkcenter Fitness in Boise. Later I moved up the road to become a personal trainer at Gold's Gym. I am now the Assistant Director of Fitness at the same gym, now called Axiom Fitness. The past three years have challenged me physically and mentally more than I could have ever imagined. After high school I went to Boise State University and was accepted into its Auto Body Repair program. I completed my associate degree and went to work. After about a year and a half I developed several health issues. I was on a treadmill one morning and passed out. After conversations with several different doctors, it appeared the only alternative would be to change my career path. I went back to school to work on a degree in exercise science and am still working in the field today. I guess you could say it was a healthy alternative to painting cars. What is your training style? My methods closely resemble the OPT Model Template from NASM as far as my phases of training go. No one is the same, so I like to change things up from person to person. I hate to say that my personal training style is more like a bodybuilder than a performance athlete, but if you ask another trainer that's probably how they would answer that question about me. I strive to maintain as much functionality throughout my workouts as possible. What good is a bunch of muscle if you can't use it? And don't tell me it's for the ladies! I think success stories are the reason trainers continue to do what they do. 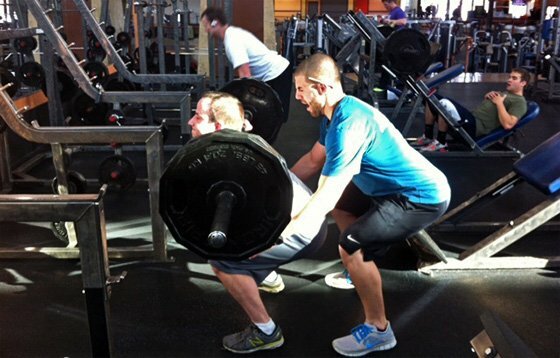 Every trainer has their own method of getting a client from point A to point B, and yeah, most of them work. The hard part is getting your client to follow the program and stick with it. This is not a means to an end; there is no magic fairy dust and no easy way to go about it. Many of the clients I train are success stories, but that has nothing to do with me. Clients put in the time, hard work, and effort to make a huge life change. Not sticking with the program! Sometimes it can get a bit frustrating and at times you want to throw your hands up and say "What's the point?" Personal training is a huge investment, but often that investment is wasted. Sticking to the program once or twice per week, or just on the days you train with your trainer but not following it otherwise, will never work! What are the most common mistakes you believe trainers makes? You can't pick a workout out of an Oxygen magazine and expect it to work for everyone! A lot of times trainers forget their title: personal trainer. I love my job because I get to know people, and everyone is different. This brings up another mistake I have run into. Often I become good friends with my clients, making it easy to lose sight of the goal. Build rapport with your client, but never lose sight of what you are trying to accomplish. I would love to work with my clients forever but unfortunately most of the time that just isn't possible. I want this to be something they understand, so that each and every one of them knows how to do it on their own. Fortunately at Axiom I have been given the tools to help make every client successful when they decide to take the reins on their own. Through each phase of training I will print off their workout plan. This usually consists of days on and days off, duration and types of cardio, and stretching and areas of myofascial release. Our nutrition platform is called DotFit, and it consists of supplements as well as an online profile where clients can log their food and track their calories and macronutrients. This program also allows me to keep track of a client's nutrition when they aren't even around. The only way to keep somebody motivated is by getting to know that person. Like I said every client is different, and you can't use the same method on two different people. This part of my job takes a bit of digging. Sometimes I might be on the verge of losing a client before I find what motivates them! Do you train a male client differently than a woman? "Give them what they want, sneak in what they need," is a little quote my manager shared with me. For the most part, human bodies operate the same, physiologically speaking. I train most people using the same forms of exercise. Yes, there are certain things women love to do, and the same goes for men; I will sneak those in from time to time. You find what keeps a person excited about physical fitness and tweak their program to match that. How have you changed your approach to clients over the years of experience? The biggest factor when it comes to personal training is self confidence. It is easy to give in, to say, "That's alright, we'll have better results next week." Clients become clients because they need help, not another excuse. It's not fun being the bad guy or coming off as mean and unwilling to understand. But the day they reach their fitness goals, finally grasping what they worked so hard to accomplish, that overwhelming feeling of gratification makes it all worth it. We call it a BSA or "body success assessment." 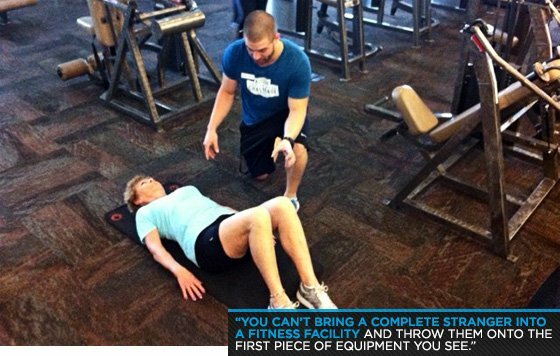 You can't bring a complete stranger into a fitness facility and throw them onto the first piece of equipment you see. Our assessment might take up to an hour and consists of a health screen, structural integrity assessment, and the part we all love, a body fat test. This assessment allows us to dig in and find what a person wants to accomplish, what motivates them, some of their structural deviations, and what might be the safest and quickest way to get them there. It's not that we prefer to train women, it's that I've found that women are often less prideful and more willing to ask for help. I like a good mixture of both. As a man I feel as if I have a better understanding as to what a male body can handle. I feel safer putting a male client under greater loads and stresses. But to my great surprise, men whine and complain a lot more than women do. I have trained a couple of female clients who put me to shame as a trainer. The harder I push them the more trash-talk they spit my way. Do you feel like a psychologist as well as personal trainer? More like a bartender! Along with their physical problems, most people like to run their personal problems by me as well. An hour is a long time! I guess we need something to talk about. An open mind is a must when it comes to working one-on-one with someone you have never met. Some of the best times I have experienced as a fitness professional have been sessions I spent training little old ladies who signed up just because they wanted somebody to talk to.